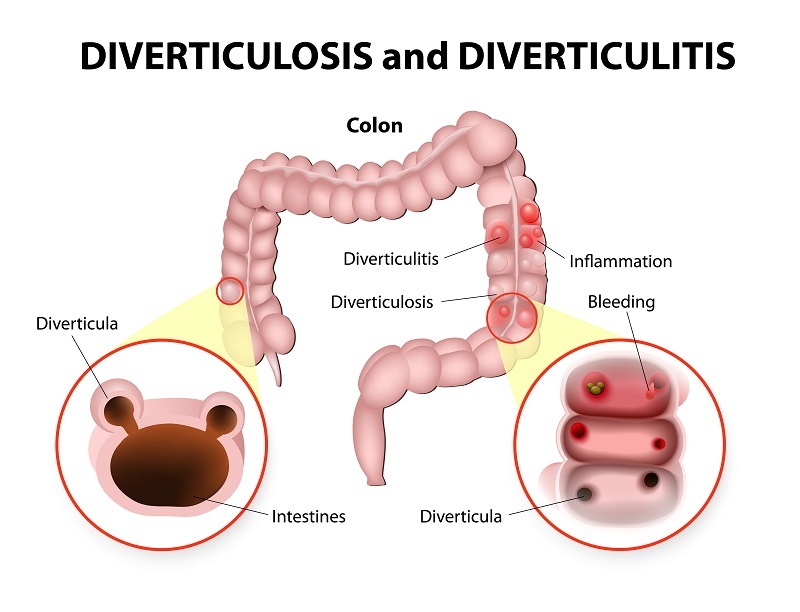 What Is the Difference Between Diverticulosis and Diverticulitis? – Downriver Gastroenterology, P.C. Diverticulosis and diverticulitis sound similar but describe different conditions. One leads to the other, which is why it’s important to understand what they are and how they are treated. Diverticulosis describes exterior pockets, or diverticula, that form on the colon. They usually cause no symptoms and are often found in the sigmoid colon. Patients in the United States and Canada are more likely to develop diverticulosis. About 50% of people ages 60 and over in these countries have the condition. That number goes up to two out of every three people over 80. It’s uncommon in adults under age 40. Some patients may notice rectal bleeding with no pain. Approximately 80% of cases with acute lower gastrointestinal bleeding require no treatment. Diverticulitis is a disease that can appear when diverticula are present. Modern medicine does not yet have a good understanding of what causes this digestive condition. 40% of cases are believed to occur due to genes, and 60% are attributed to environmental factors. People who have a family history of the disease, are obese, smoke, or do not exercise are more likely to develop diverticulitis. If you notice symptoms or changes that could indicate a digestive problem, contact a gastroenterologist right away. A specialist can evaluate your condition and make recommendations for treatment and relief of symptoms.